I spent Friday in the village of Cantagallo (Singing Rooster!). 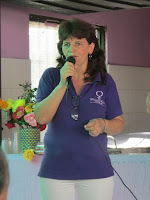 We were accompanying the Colombian Popular Women's Organization, OFP. They requested CPTs accompaniment for "reclaiming sacred space" in their women's community center following a killing there a few weeks ago. 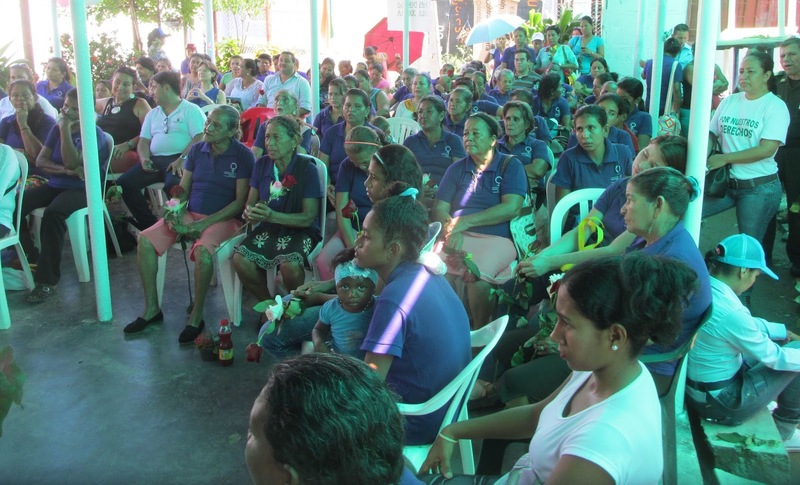 In response to this type of violence, many villages and organizations in Colombia declare "a zone of peace or humanitarian space" where no weapons are allowed. The Cantagallo OFP had done this years before, so having a killing there was a significant offense. The OFP invited community members as well as officials of the Mayor’s office for lunch and a Catholic liturgy to reclaim the sacred space. The trip to Cantagallo and back began with a one-hour chalupa boat ride. This is how Colombians travel on the major rivers like our Mississippi. It's like being in a motorboat mini-bus for 20 people - wonderful scenery, wind in your hair, and sun on your face. The two directors of the organization, Yolanda and Gloria, have 24-hour armed bodyguards for protection, but the guards weren’t present as we were reclaiming this sacred no-weapons space. My fellow CPTer, Pierre, and I were their unarmed bodyguards for the day. Anonymous actors have threatened Yolanda and Gloria’s lives because the OFP speaks out against the ongoing civil war and violence in general. Certain right-wing groups believe that any group that speaks out publicly against the violence is associated with the left-leaning guerrilla groups. The day began with a meeting at the local mayor’s office. 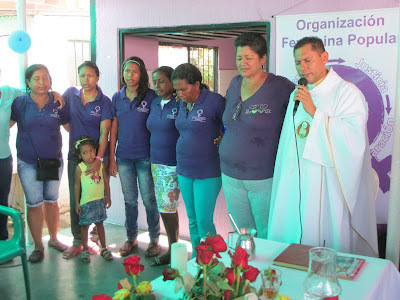 The OFP, their lawyers, and the Director of the Organization of Victims of the War were there to negotiate the scholarships, jobs and money the Cantagallo OFP will receive through the Mayor’s Office on Victims of the War. 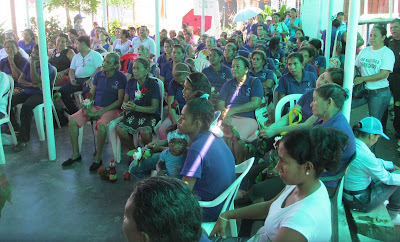 When the negotiation was complete, we walked through the narrow streets of the port town to the humble women’s center with a small kitchen and large covered patio area for the gathering. We enjoyed a local soup called sancocho with veggies and chicken legs and waited for community members to gather for the liturgy that would begin at 1pm. By the time we began singing, the patio was teeming with at least 100 women and children in their purple OFP shirts ready to reclaim the sacred space. Many rural women have been impacted in some way by the violence of the 60-year long civil war between rebel guerrilla groups demanding land reform against a combination of government forces and paramilitaries or hired guns. In the last 30 years the violence, impacting 15% of the population, is primarily from the paramilitary groups involved in the cocaine trade and supporting the interests of multinational corporations desiring to mine and develop the many resources Colombia has to offer. 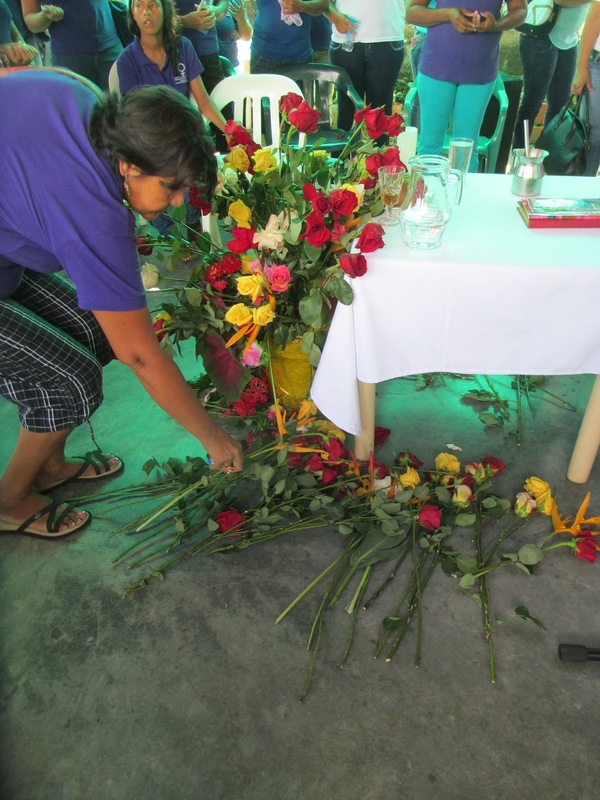 We enjoyed scripture readings, songs, prayers, and short speeches from local leaders. The priest’s homily focused on love of enemies - very appropriate for the occasion. The local leaders passed out roses when we arrived and in the end we brought them forward to our simple altar to symbolically reclaim the sacred space. Passing of the Peace of Christ was especially joyful and we ended in a circle reminding us of our strength together. These women know how to reclaim sacred space and I was honored to play a part. Thank you Julie. Wonderful to see the faith community leading the community in such a public way.